Today in Mark 1:9-15 we look at three different sections, 9-11 is Jesus’ baptism, 12-13 is His temptation and 14-15 is the beginning of His public ministry. First the baptism of Jesus. Yesterday we met John the Baptist. I’ve had people ask me before was John “inventing” something new in Baptism? The answer is not really. In the Jewish tradition there was the tradition of mikvah baths, these were ceremonial baths that would be taken before times of worship or for purification. Many scholars believe that these washings were the forerunners to baptism. But these were normally not done in a river, and were not done out of a heart of repentance, so John was not just doing what had always been done either. Notice what happens after the baptism though. In that moment we see the Spirit descend on Jesus and the Father speak from heaven, so here we see all three persons of the Trinity in their “element” in relation with each other. The Trinity is at its core a relationship. The relationship between the Father, and the Son, and the Spirit. And if God is Trinity, and Trinity is relationship, and we are made in the image of this Triune God, it means that we are made for relationship. We were not mean to be alone or to walk alone. We were meant and created to live in relationship with God and with each other. So Jesus has this high point and then from there, He was led (or driven) by the Spirit into the wilderness, where He was tempted by Satan. A couple things here. First, temptation in itself is not sin. Jesus was tempted, but He did not sin. So, there is nothing “wrong” with temptation. Temptation can lead us into sin, but temptation is not sin. We are all tempted, and we will all face temptation. You will be tempted. If Jesus was, you and I will be too. Second, He was not tempted by the Spirit. We are never tempted by God. He was tempted by Satan. There are times God may lead is somewhere for testing, but always know that testing is for our own benefit, not for God’s. God knows what we will do and what we will decide. So when we face temptation or testing, know it’s for our benefit and for our strengthening, not for God’s benefit. Jesus was going to face many trials and tough times during His ministry. He would be abandoned and betrayed by His friends, He would be beaten and mocked. This temptation may have been a time of “practice” or “preparation” for that. So may our temptations be. And in our final section, we see Jesus’ message to people. Repent and believe the Gospel. Repent. Just like temptation is not sin, we often mistake conviction for repentance. Conviction is when we feel bad about our sins. Repentance is a turning from our sin. Jesus is saying this. Stop doing things that are hurtful and destructive to you and to others. Turn from them. And turn to me. Repent and believe the Gospel, or Good News. What is this Gospel? We are broken and sinful. God sends us His son to love us, teach us love, show us love, die for our sins, be resurrected for our life, ascend for our glorification and one day, return for our victory. So, turn from things that are destructive. And turn to Jesus. That’s the Gospel. That’s the good news. Jesus preached it. And we are called to as well! 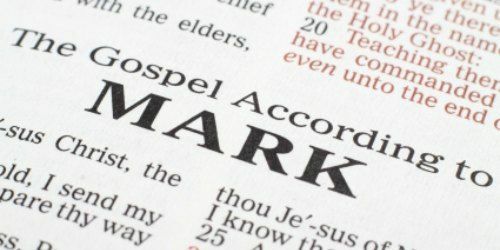 Tomorrow we’ll look at Mark 1:16-28.